I always wanted to leave football on my terms but in the end I suppose it was mutual. After 17 years as a professional player with Arsenal, Reading, Yeovil, Hereford, Shrewsbury and Crawley, today is the first day of the rest of my life. Today I am starting work as a teacher. It is actually the same school I attended - I am teaching business and ICT at the Maltings Academy in Essex - so it is not completely alien territory. But it still means going from a 33-year-old, respected member of a dressing room to the equivalent of a 19-year-old starting a new job. I have known this time was coming, of course, so over the past four or five years I have completed a business management degree and done my Uefa coaching badges. During the last year, I've been going into a school on my day off on a voluntary basis and I was eventually offered a job. The thing that triggered all this for me was buying a house in my mid-20s. Before that, I would join a new team, go off in my car with a bag of clothes and rent a room off another player. It was as simple as that. But having a mortgage meant that I could not just go back to living in my dad's spare room if I left a club. I knew I needed to plan ahead. I had not been involved in education since leaving school with no qualifications at 16 but I decided to start a flexible access course. 1995 - Signs professional contract with Arsenal. 1996 - Joins Reading but makes just one appearance, in a 3-2 defeat at Manchester City. 1998 - Signs for Yeovil and plays 141 times for the Glovers. 2001 - Joins former Yeovil manager David Webb at Southend but makes just one appearance for the Roots Hall club. 2002 - Drops into the fifth tier for two seasons with Hereford. 2004 - Joins Shrewsbury following their promotion to the Football League. 2006 - Moves to Weymouth and helps them to the Conference South title. 2007 - Joins Hereford for £20,000 after Weymouth suffer financial problems and plays 44 league games as the Bulls win promotion to League One in 2008 and makes 37 appearances in the third tier the following season. 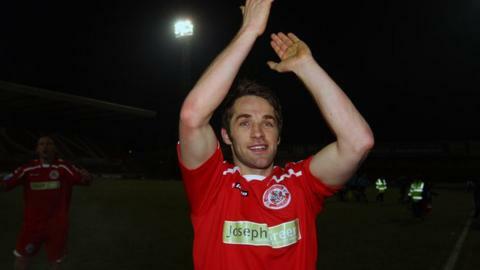 2009 - Joins Crawley in the Blue Square Premier and scores seven goals in his first season. 2011 - Plays as the Sussex team are beaten 1-0 by Manchester United in the FA Cup fifth round at Old Trafford. Helps the club to promotion to the Football League. Joins Kettering on a month's loan in September. 2012 - In January Smith joins Aldershot on loan for the rest of the season and is released by Crawley in May. Trains with Blue Square Premier side Braintree Town but eventually joins AFC Sudbury in Ryman League Division 1 North. There were 10 of us in the room and we were asked to write down an introductory paragraph about ourselves. I just spent 15 minutes staring into thin air. These days, I could do something like that in a minute but at the time I just was not used to thinking that way. I cannot have been the only one, either, because the next week there were about five people there. The way I did my degree also sums up a footballer's life because I ended up studying at three different places. I left Shrewsbury to join Weymouth on loan and then moved on to Hereford before doing my dissertation at Crawley. All of the colleges and tutors bent over backwards to help me but moving around so much was not ideal and it would have been easy to give up. At the end of last season, it was clear that I was not going to be offered a new contract at Crawley, having spent much of the time out on loan. At this age, it is tricky to get the money you want at the right club and I didn't really want to be moving again for a one-year contract. When you are 24 or 25, one good year can change your career, but at 33 nothing like that is going to happen. It has been an uncertain time preparing for a new career and I had my share of job applications that were not even acknowledged. I do think there are a lot of transferable skills from football that enlightened employers could use. We can work in a team, we are dedicated, disciplined and can function under pressure. But not many employers appreciate that. Of course, I know players my age who have no qualifications at all. They are used to earning a good wage, even as a lower league footballer, and are just looking to sustain that standard of living for one more year. Even in League One, players can be earning £40,000 or £45,000 a year. You can struggle to get £25,000 in a so-called normal job. It's a lot of money to make up, so they hang on in there. In my new life, I'll be working nearly three times as many hours and not getting anywhere near as much money. I am apprehensive - I don't really know what to expect - but I cannot wait to get started. The kids at the school already know all about my football career and the ones that don't will soon see the clips and hear all about Crawley's FA Cup game at Manchester United last year. Did I have the career I wanted after joining Arsenal at 16? No, but to make a living out of football for 17 years is an achievement. As for my new school, I'll be getting thrown in at the deep end. That's not too dissimilar to joining a new team on a Thursday and playing in front of thousands on the Saturday. Ben Smith was talking to BBC Sport's Graham Chase.